On May 1, Pope Francis in his General Audience spoke both of St. Joseph the Worker and the Virgin Mary. This post does not contain the entire audience, just the references to Mary. Let’s take a look at the Marian references. Today, the 1st of May, we celebrate St. Joseph the Worker and begin the month traditionally dedicated to the Virgin Mary. Pope Francis acknowledges this longstanding tradition of the Church to honor Mary during the month of May. Remember that Pope Francis has invoked Mary’s protectress role and the role of Joseph protecting the Church from the first days of his papacy. Dear brothers and sisters, let us ask St. Joseph and the Virgin Mary to teach us to be faithful to our daily commitments, to live our faith in everyday actions and to give more space to the Lord in our lives, to stop to contemplate his face. As I mentioned in a recent post, Pope Francis speaks about specific actions of the Madonna. He has spoken often about her protection, help, and today he tells us that she can teach us to be faithful to our daily commitments. Also, Pope Francis speaks about contemplating Christ’s face. 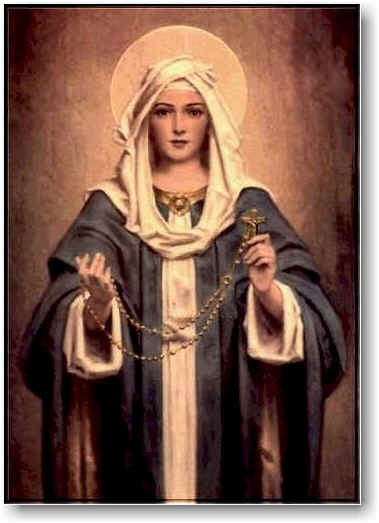 Pope John Paul II in his Apostolic Exhortaiton, Rosarium Virginis Mariae, referred to the rosary as an aid to contemplating the face of Christ in the school of Mary. It seems that Pope Francis is inviting us to contemplate the face of Christ through the rosary.